Once again: Happy New Year to all of you! 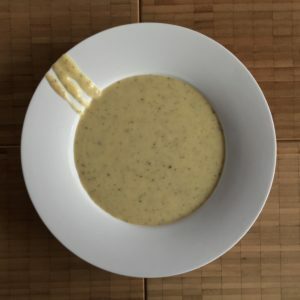 That morning – sometime during the last weeks – my window thermometer displayed about 5° C. It was misty, the sky covered w/ more or less dark clouds… So I thought that my idea of doing a thick comforting potato soup for dinner might be the right answer to this temperature challenge. 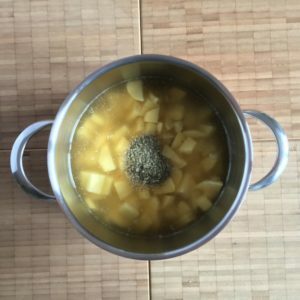 Potato soup is somewhat more complicated than a simple clear vegetable soup – you remember my basic soups w/ Asian touch & more because you need mashing the potatoes! 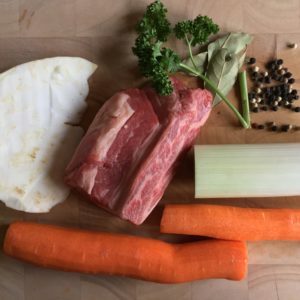 However, it’s – at the end – a fast & easy soup for any weeknight dinner. Potatoes are not very flavorful by themselves. 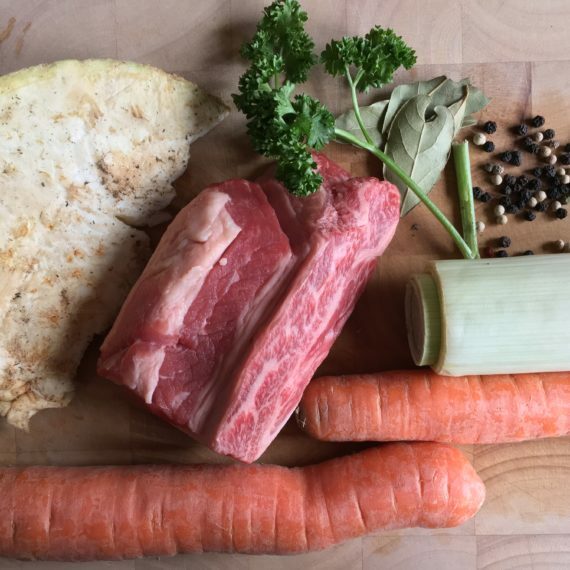 We have to add some distinct add-ons to create a savory soup. 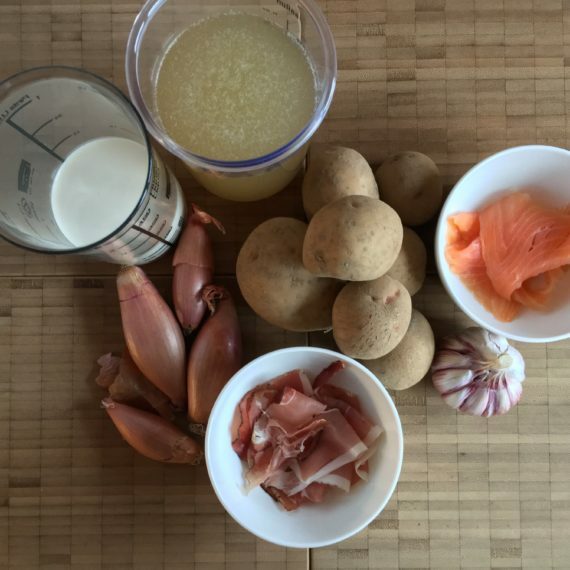 I decided on bacon & smoked salmon… & I started w/ an opulent stock for cooking the potatoes. I talked about stock making before – & that it’s a lengthy affair. Normally I’m not up to these adventures in my kitchen. However, I happened to find some beef for making broth in my freezer. So said & done some days before I went shopping in my trusted food store. I took some carrots, some celery, some leek… in addition I had bay leaves & peppercorns & some fresh parsley. A very simple approach. I cleaned & trimmed the vegetables & cut them into chunks. The beef was cut alike. …& then all simmered in lots of salted water for about 2,5 hours. Most of the stock went into the freezer, but 500 ml were stored in the fridge for my planned potato soup. …& a bay leave & some dried marjoram & fresh parsley (for finalizing!). We start w/ cleaning & peeling the potatoes & cutting them into small pieces. Together w/ the beef stock & dried marjoram we bring it to a boil & let it simmer afterwards for about 15 min. The potatoes should be very soft at the end. In the meantime we trim & chop the shallots. 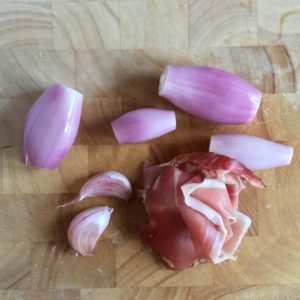 We chop the bacon as well & we press the garlic (I had 2 cloves of garlic!). Adding a bay leave we fry everything in some olive oil for about 10 min. Take care: nothing should get burnt! …& we chop the smoked salmon (for later!). 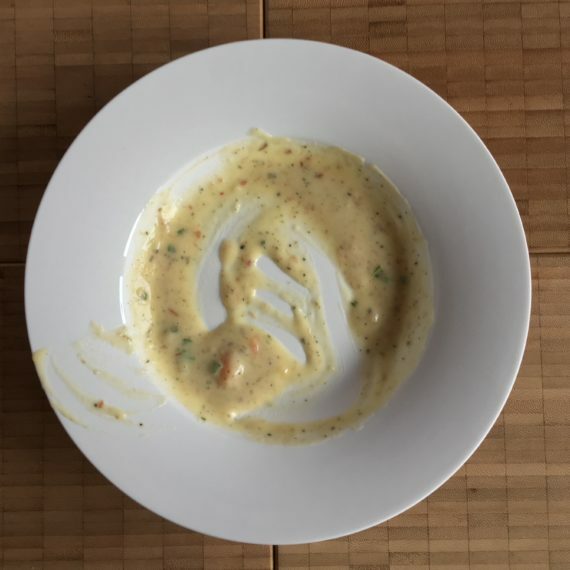 As soon as the potatoes are soft we add the fried mess to the soup. Now it’s action time for our handheld blender. The clear & lumpy soup will be transformed in a creamy soup. Attention: it’ll get very sticky. The starch of the potatoes is doing its duty. 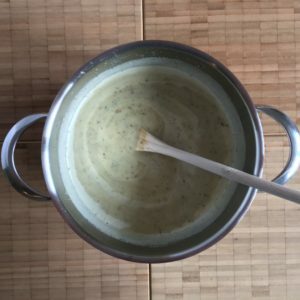 If you prepare a potato soup always use the handheld blender, however, never use this gadget when preparing mashed potatoes – use your manual power for mashing. In a soup the potatoes deliver the smoothness by their starch released during blending. Mashed potatoes will seem somewhat slimy when made w/ an electric handheld blender: it ruins the mashed potatoes! Next step: adding the cream. If the soup is as thick & soft as you like it add salt & pepper to taste. I think you shouldn’t be stingy w/ pepper. The chopped salmon & some chopped fresh parsley will finalize the potato soup approach! 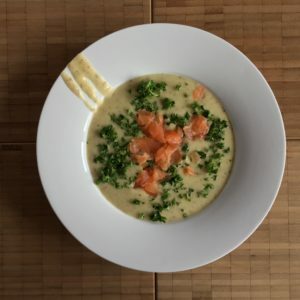 A thick comforting potato soup with a savory edge from bacon and smoked salmon - what else do you need when temperatures drop to freezing? 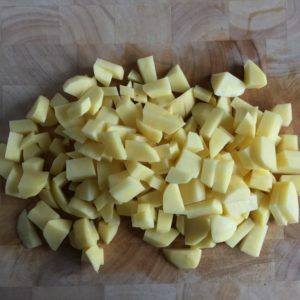 Clean & peel the potatoes & cut them into small pieces. In a pot bring potatoes & beef stock to a boil. 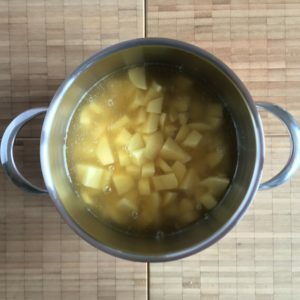 Let it simmer for about 15 min; the potatoes should be very, very soft! In the meantime chop the shallots & the bacon. Fry shallots, bacon, garlic w/ the bay leave in olive oil until soft resp. a little crispy (about 10 min). Add the fried mess to the pot w/ the cooked potatoes in the beef stock. Take your handheld blender & blend the mess. Careful: it gets very sticky! 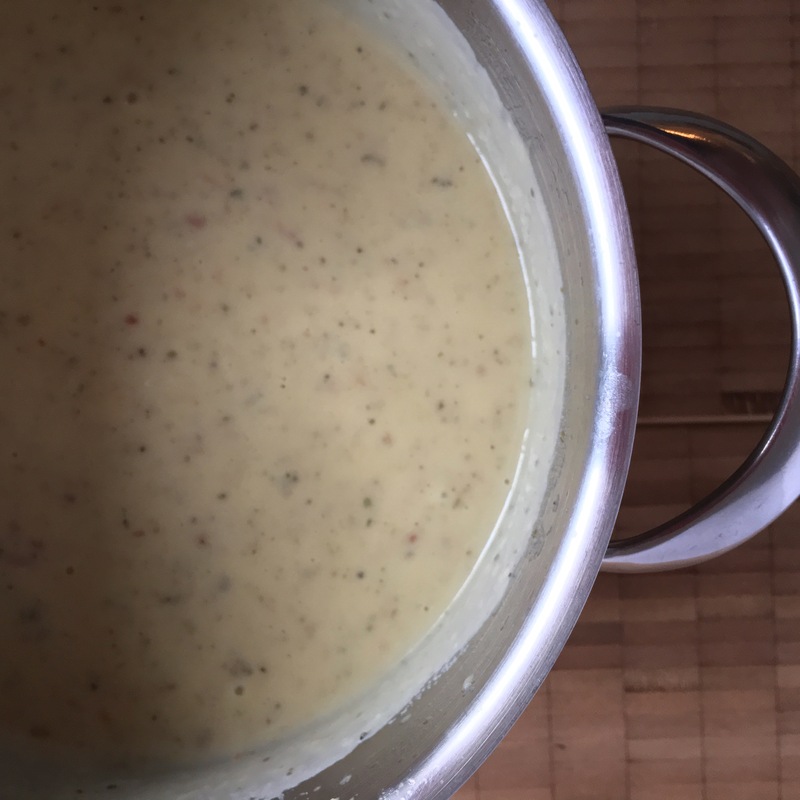 Add the cream in steps & mix well w7 a spoon until the soup has the thickness & smoothness you like. Careful: it likes to bubble spontaneously! Distribute the soup evenly over 2 big bowls or 4 small bowls. 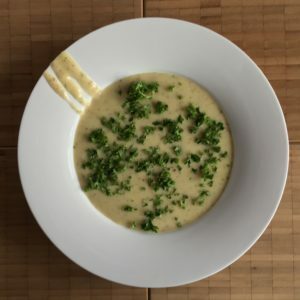 Sprinkle the fresh parsley over the soup. Add the chopped smoked salmon on top. Prep Time: It’s the preparation as well as the cooking. 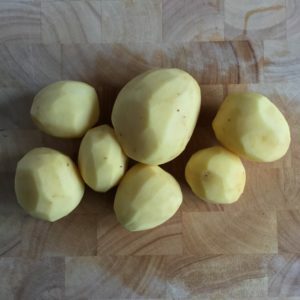 Potatoes: Make sure to use floury potatoes only! The soup needs their creaminess. 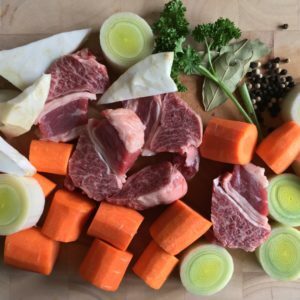 Beef stock: I used homemade beef stock (made from beef w/ carrots, leek, celery, parsley, bay leaved, pepper corns for making soup). You may also buy ready-to-use beef stock at your trusted food store. Alternatively you may use chicken stock. 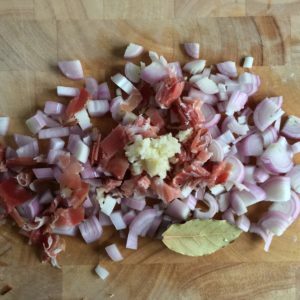 Shallots: I happened to have some shallots in my pantry. You may also use spring onions or any other onions. 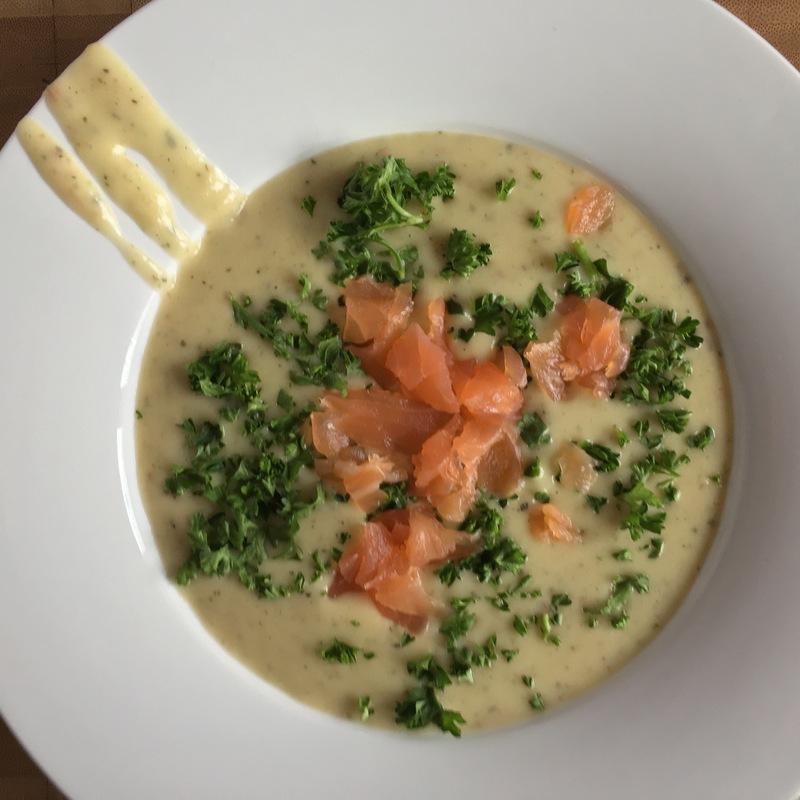 Smoked salmon: You may stir in the smoked salmon before serving when the soup is still in the pot. The soup is fine in the fridge for at least 1 day. 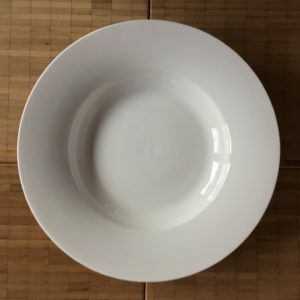 Reheat in the microwave. Sorry: no experience w/ freezing. Was it a little to quick? 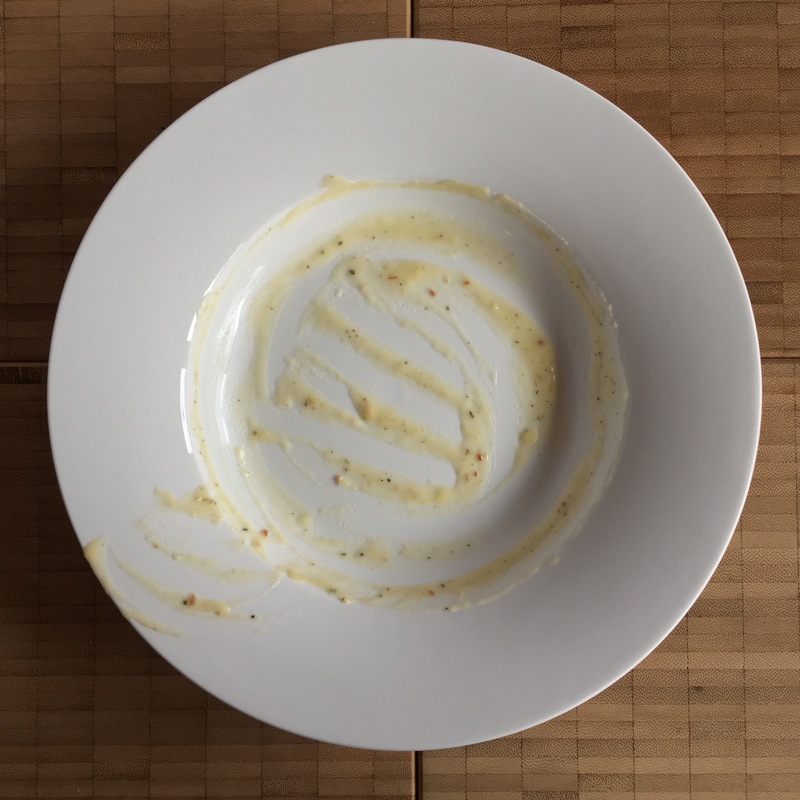 So: we start with an empty soup plate & fill it w/ plain potato soup. Then we sprinkle some fresh chopped parsley on top. 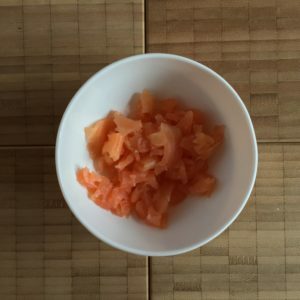 …& finally some of the chopped smoked salmon will add another strong flavor. Where comes the parsley from? Well: I bought fresh parsley some days before – as always there was much more parsley in the bunch than I needed for the moment. What to do? Make sure that the parsley is dry – pat it dry & leave it for drying for some hours if it’s wet. Then you can shop the parsley as fine as you like it – or need it. Put it in an airtight container & store it in your fridge in the fresh department (temperature almost 0° C). The chopped parsley will be fresh for about 1 – 2 weeks. 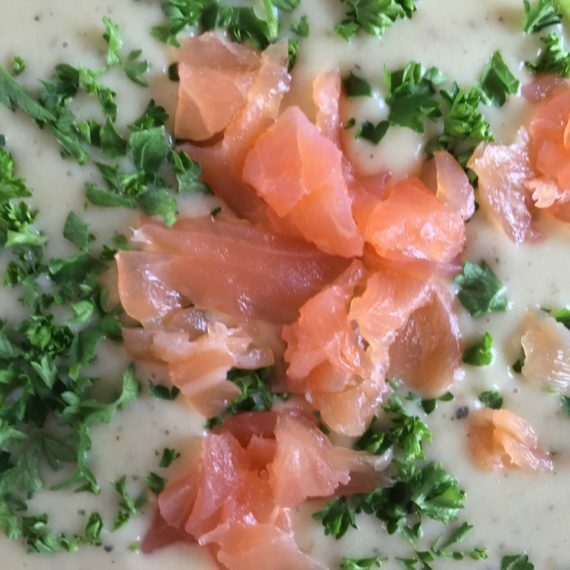 Of course you may also mix the smoked salmon & the parsley into the soup. 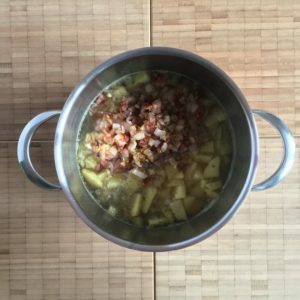 Yes – it is somewhat more complex to do a potato soup than a simple clear vegetable soup. However, I think the stress is reasonable. 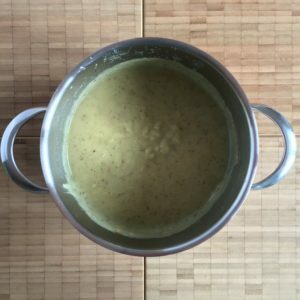 This smooth soup w/ its strong flavors… delicious!